Weird football plays have caused mayhem for sportsbook recently, and the NFC Championship was no exception. There’s likely few sports fans that haven’t seen the play, but Rams cornerback Nickell Robey-Coleman delivered a massive hit to Saints receiver Tommylee Lewis while Lewis was attempting to catch a pass. Usually such a hit would be called pass interference, and the NFL admitted later that the hit could also be considered a helmet-to-helmet hit that’s now a penalty in the modern game. However, the play was deemed clean by the officials. Had any penalty been called, the Saints would have had a first down that would have ended the game. 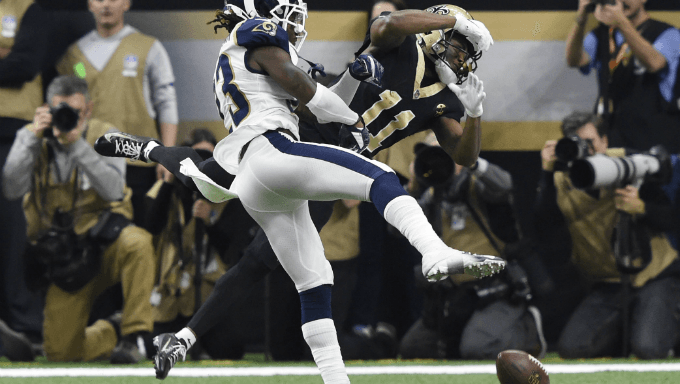 However, the no-call made by the officials gave the Rams a chance to drive the field and tie the game, which they did. The Rams would go on to win in overtime. Saints head coach Sean Payton later said that the NFL admitted to him on a phone call that the play should have been one of two penalties. The fallout of this play is still reverberating around the league and nation as bookmakers and gamblers try to make sense of what happened. For one, New Jersey sportsbook PointsBet announced on Monday that they will be refunding all bets made on the Saints. The company later clarified that the refunds would be made in the form of bonus bets instead of cash payouts. However, this is the first instance of a US sportsbook refunding bets due to the actions of the referees. While the NFL might have reversed course on Monday and decided to not release any statements about the call, it is generally accepted that a first down would have allowed the Saints to win the game. Action Network’s Darren Rovell reported on Monday that he expected a class action lawsuit to be filed against the NFL, implying it would be on behalf of those who lost money betting on the game. 25 hours later, Rovell reported that a New Orleans attorney had filed a civil suit on behalf of the Saints season ticket holders. There’s no word yet if there will be a civil suit filed on behalf of gamblers who lost money on the game. It’s expected there will be multiple suits filed by various parties regarding the result of the game, so expect further updates should a gambling-related suit be filed.